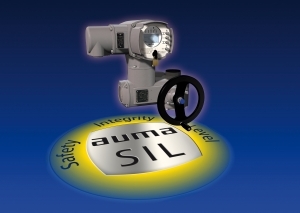 A new module designed by AUMA provides enhanced Safety Integrity Level (SIL) capability for the company’s electric actuators. The development enhances application of AUMA’s modular actuation technology, which is widely adopted in safety-related systems. In safety critical applications, the operation of actuators is frequently linked to significant additional expenditure and effort for safety related system planning and installation. The integral module, located within AUMA’s AC actuator controls, addresses this providing a simple and effective solution comprising transistors, resistors and capacitors. AUMA’s AC actuator control advancement supports latest automation technology developments, including asset management, which require increasingly intelligent field devices with comprehensive software-based diagnostic functions. The new hardware-based integral SIL module improves the SIL capability of the devices. In standard operation mode the SIL module is inactive. If the safety related function is required, the module takes over actuator operation management: diagnostic functions and feedback signals remain available in this situation. Determined safety figures for the actuators allow implementation in SIL 2 applications. SIL 3 can also be supported if these are designed in redundant architecture (1oo2).